Our Feather Flags or sometimes called Sail Flags are a unique shape and great for attracting attention, unlike traditional flags, don’t require any wind to get the message across, Feather Flags can be set up in a couple of minutes, creating impressive advertising for any occasion, ideal for use at events, festivals and forecourt advertising. 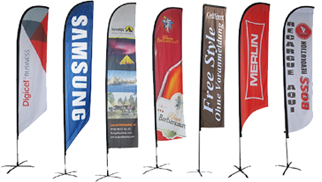 Our flag printing service means You can have any design you like on our Sail Banners and Feather Flags including photos, text and logos, in virtually any colour, they are printed in full colour onto high quality knitted polyester which is included in the price. We have options for indoor and outdoor base plates. Artwork proofs are submitted for your approval before production.Our standard delivery is 05/10 working days. We can Express Print your order within 5 working days on request. Free delivery on 2 or more.